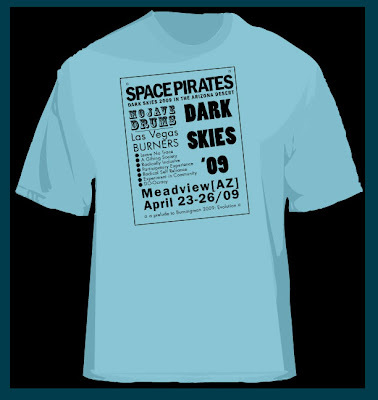 The organizers from Dark Skies sent me an email letting me know about the theme of their upcoing event. A SouthWest Regional art festival held in the Arizona Desert kicks off on April 23rd for 4 days. I was excited about the oppurtunity to propose a couple designs. 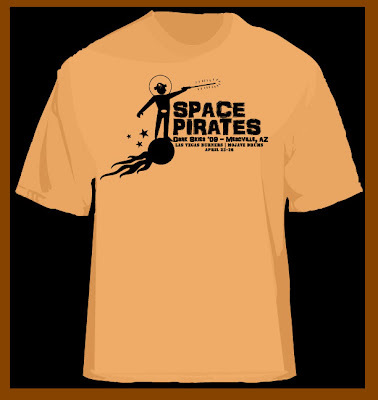 The theme is “Space Pirates”! With the long established history of the organization, it’s association with the infamous Burningman group and other art oriented groups, I proposed 3 concepts for their t-shirt and other collateral. Here are the 2 they did not choose. Out of 3 composite designs they chose #3, which I am not publishing here yet because it will be unveiled in the coming weeks. It is genuinely exciting to have been chosen in this process.